The Colibaba Kebab featured falafel, cauliflower and eggplant as its main ingredients. The falalel is made using Egyptian recipes with fava bean, instead of with chickpeas, giving it an unexpected vibrant green colour. Both the falalel and eggplant were crispy on the outside yet smooth and flavoursome on the inside. The cauliflower pieces were minuscule, and consequently, its unique aromas did not permeate through the kebab. 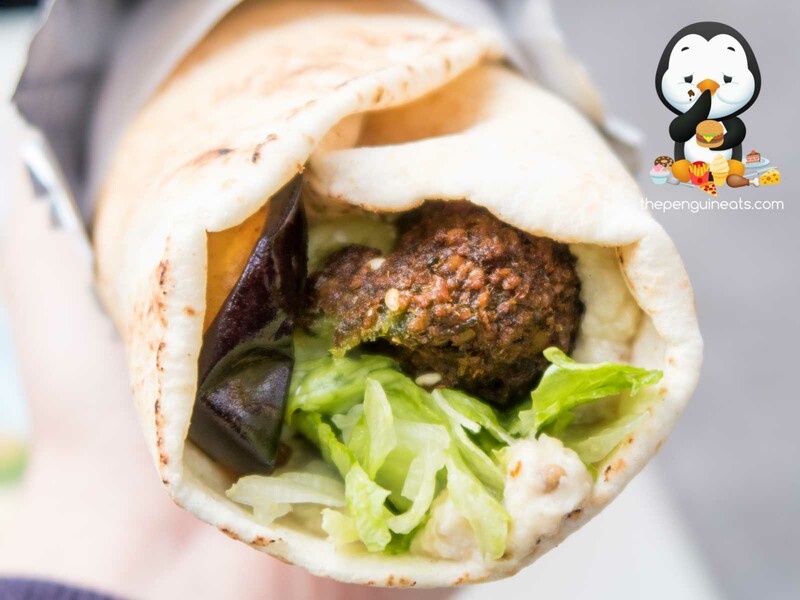 The yoghurt and babaghanoush eggplant paste gave the kebab a moist interior and provided contrasting flavours on top of the eggplant and falafel. Even though we would have preferred more cauliflower, this kebab is easily near the top – if not the top – kebab we’ve had in Melbourne. The Lamb Main Dish platter had generous portions of every element. The lamb was beautifully cooked. It was fatty enough that it was soft to the bite but not too greasy. The bread was fresh. The three dips gave the lamb extra punch when slathered on the bread. The tastes were all well balanced. 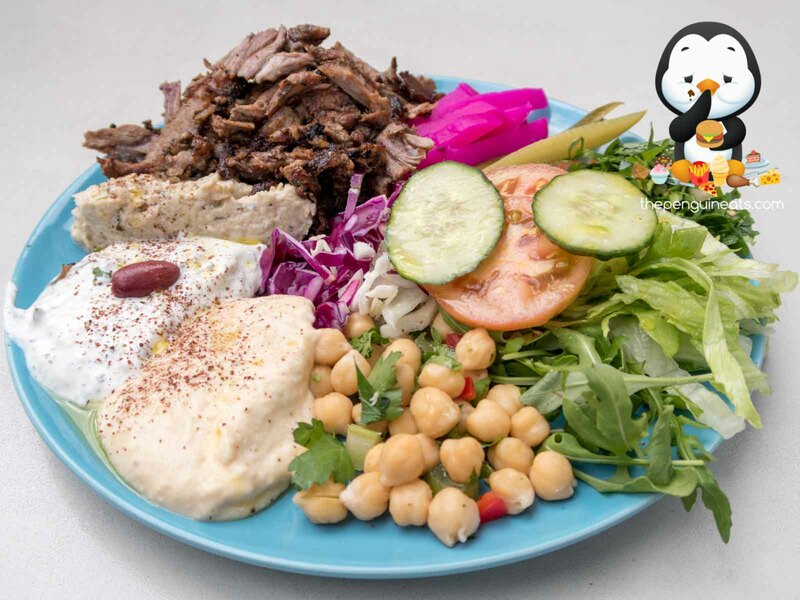 There is no fault with the lamb platter, especially given its size and price. 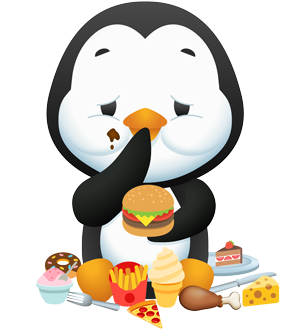 However, as with all shawarma lamb, the effects of salt were obvious to this sodium-intolerant penguin in the aftermath. 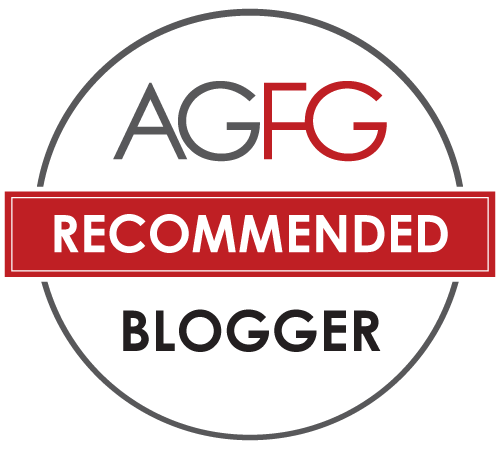 Even though the food was exceptional, the service was unfortunately not so. The lamb platter took an unreasonably long 25 minutes to be brought out, given that all elements were visible in the counter. 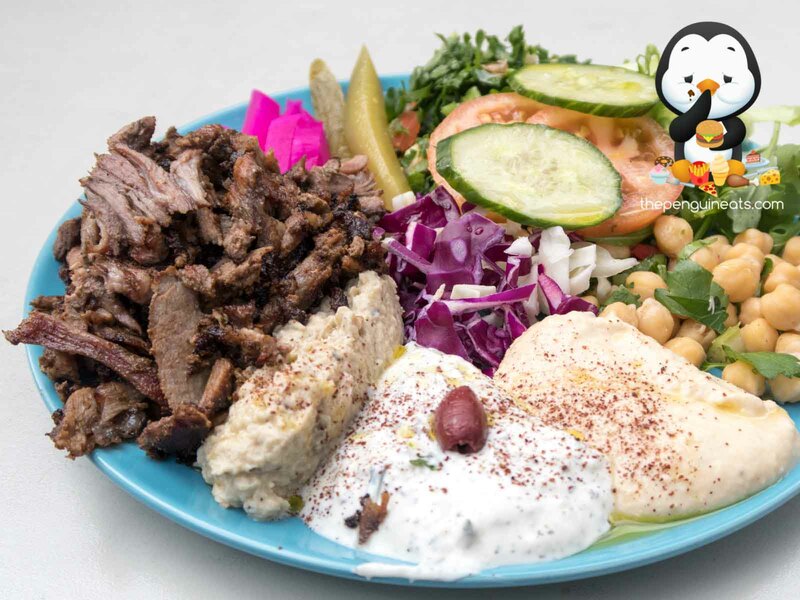 Thirty minutes after our lamb platter was served and fully devoured, we chased the staff for the Colibaba Kebab and a latte, only to be told they had lost our order. Nonetheless, the issue was quickly remedied and the kebab and coffee were promptly brought out. Half Moon Cafe is a little take-away shop situated on a small suburban square with abundant plastic furniture outside. The decor may be not fancy but they sure do serve up some amazing food for cheap-as-chips prices. The Colibaba Kebab was simply unforgettable and the other penguins all agreed they would be recommending this place to their friends. Heck yes! That kebab was so tasty and was easily one of the best in Melbourne. We crossed town for it and were not disappointed.